It has been seven months since I switched to a plant based lifestyle and became very diligent about taking back my health. I was mindful of my healing journey as I showered this morning, checking in with myself as I assessed where I am right this moment. 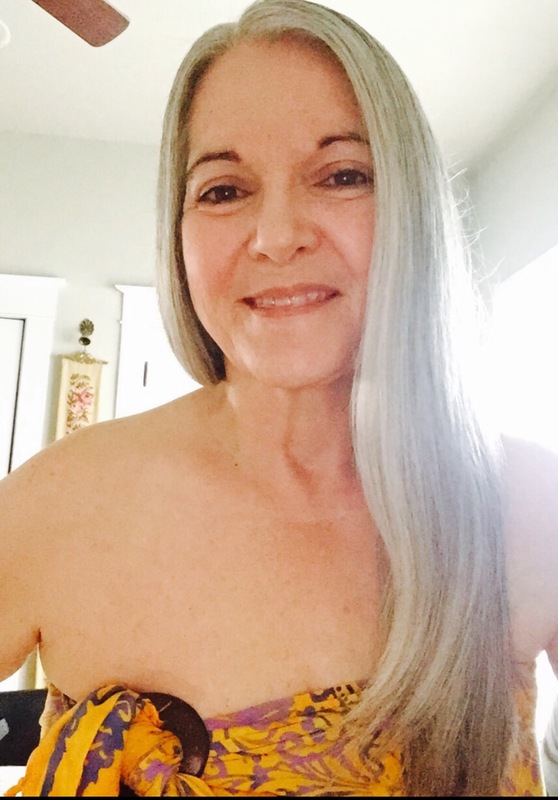 Because I was working in my creative studio this morning, after I stepped out of the shower, I felt inspired to wrap up in a beautiful sarong that I picked up on a trip to Phoenix. As the steamed over full length mirror cleared, I caught sight of myself. Hello, healthy you! I greeted myself. I was being silly. Yet instantly, my eyes filled with tears. I looked at myself, not in a critical way as I used to, but with appreciation for the amazing changes that have occured in seven short months. I have clear skin, and a glow that emanates from within. I am smaller and more fit. Best of all, my pain level was at a ZERO. Swirling like a little girl in a frilly dress, I moved freely. No limp. No cane. So many ailments have disappeared completely. Most amazing of all, my sciatic nerves are no longer inflammed. I feel healthy, strong and fit. I feel good, creating a sense of euphoria. My journey will continue. Plant based is a lifestyle for me, not a diet. I am still clearing viruses and toxins from my body. As I do, my legs are regaining flexibility and strength. The muscles around my knees tighten up if I sit or sleep with my legs bent for too long, however, there is improvement every day. I feel healing continuing. During my life, I have hidden so many aspects of myself. For years and years, I hid my intuitive side, confused by my ability to receive information in non traditional ways, afraid people would think I was a freak. I hid my voice and my thoughts, my ideas and my desires to create and grow and challenge myself, choosing to remain silent and play small. After the car accident 22 years ago, I hid the daily pain, and the increasing difficulty I had walking, until I could no longer deny it. I hid behind excess weight, and baggy clothes and oversized hoodies, and an I don’t care attitude. My little impromptu photo shoot, after I figured out how to use the timer on my iphone, is a beautiful declaration that I am no longer hiding, no longer sick, no longer in pain, no longer silent. I love my healthy body and I am tuned in to what I need and what I don’t need. I am getting to know myself in fresh new ways, and I am so grateful for this journey and this opportunity. Hello, healthy me! I am so glad to know you. Making healthy food choices is important on any diet. The choices become crucial when dining out. Since beginning the plant based lifestyle, I’ve found it easiest to prepare my own meals at home. However occasionally there is a family dinner or I am out of town or I want to pick something up on the way home after a long day. Is it possible to eat out when living a plant based lifestyle? Or while following other diets? Yes! I was in Olathe, KS today, dropping Greg off to paint a house interior for his cousin. Before I headed back to Joplin, we wanted to eat a late lunch. My experience provides a good example of how to stay true to a diet or lifestyle, while enjoying a meal out. * Avoid fast food restaurants. There are very few good options available in fast food. * Use Google, if you own a smart phone, typing in the words, vegan restaurants, and the town name, to locate healthier possibilities. Look the list over carefully! Google isn’t perfect. I Googled vegan restaurants Olathe KS and IHOP appeared on the list. While they do offer a few healthier options, it’s not a good choice for me. * Ask for suggestions. I found the perfect restaurant today by asking Greg’s cousin Tim what healthy options were available locally. * Check out an online menu before finalizing the selection, to make sure the restaurant is a good choice. I chose a new-to-me restaurant this afternoon, Zoës Kitchen in Olathe, based on Tim’s recommendation. Zoës features Mediterranean cooking using fresh ingredients that are prepared daily. * There are several good choices for restaurants, when eating plant based or following other diets. Many restaurants offer a veggie plate or allow sides to be ordered a la carte. Chose Mexican or Chinese or Thai restaurants that offer brown rice, simply prepared vegetables or salads with lots of veggies rather than iceberg lettuce with toppings such as cheese, bacon and croutons. There are good buffet style restaurants that have large salad bars full of healthy choices. However, avoid buffet style if the platters and platters of food present too great a temptation! * Carefully check out the menu before ordering and don’t hesitate to ask the wait staff questions about ingredients or food prep. 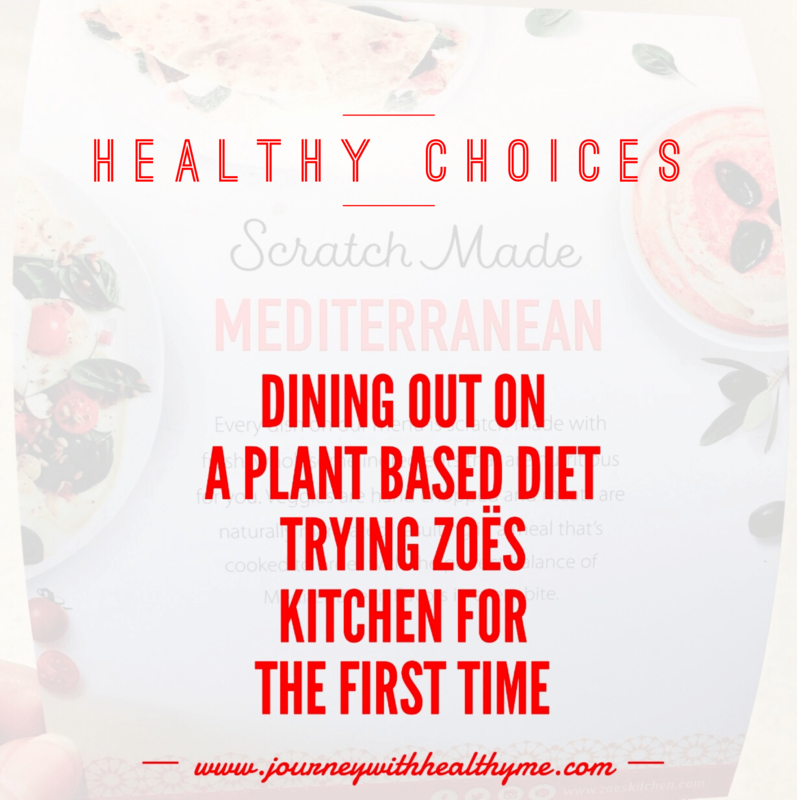 Zoës Kitchen made it easy to make great choices. Their menu listed exactly what was in each meal, and they even put a V for vegan next to plant based meals. 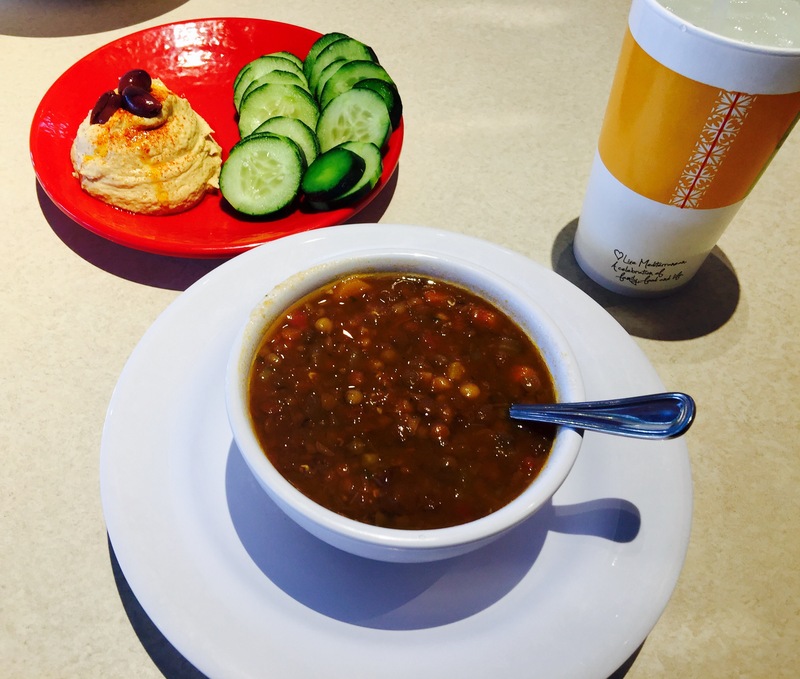 Greg and I shared Classic Hummus with Cucumber Slices, and we each had a bowl of Mediterranean Lentil Soup. Both were delicious! I loved that the hummus came with cucumber slices. Pita bread was available on request. That made me feel that Zoës has my best health in mind. * If the meal isn’t right or what you expected, don’t feel like you have to eat it. Most restaurants are happy to get it right for you. * And if the meal is more than you can comfortably eat, take the rest home. I like knowing I have another healthy meal ready to eat in the fridge. With a little knowledge and preparing, eating out doesn’t have to set me back or make me feel guilty, or worse, make me feel bad, physically. I have a short list of approved restaurants in the Joplin area. And I love discovering new vegan restaurants in bigger cities, and places that at least have plant based options on the menu. In the end, eating out isn’t supposed to be stressful or a reason to cheat on a diet or lifestyle. Its about connecting with others, having fun, and nourishing the body and the soul. When I can accomplish all three, it becomes a beautiful experience. 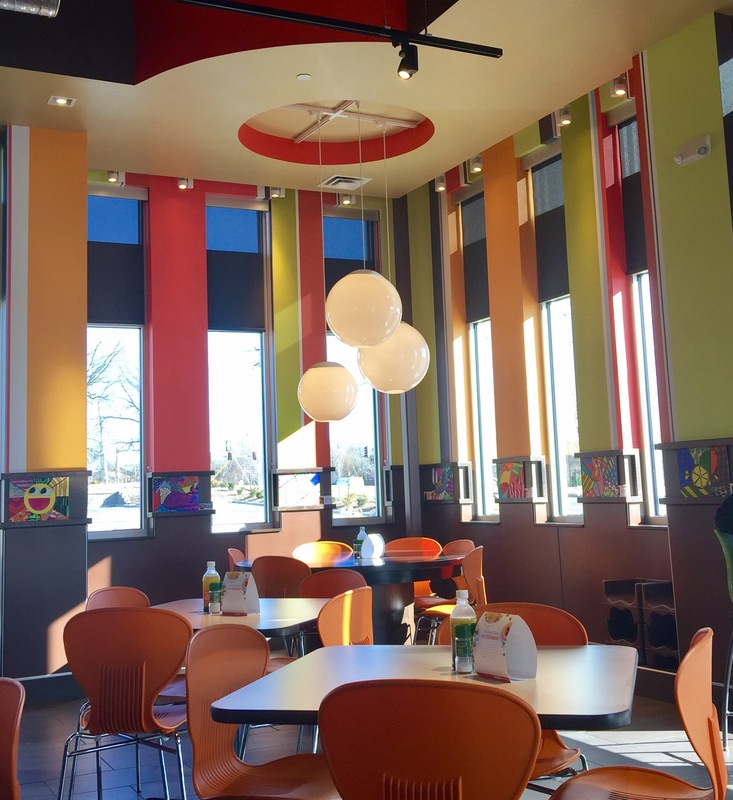 Zoës Kitchen in Olathe met that criteria, providing wholesome, flavorful, healthy food in a fun, colorful atmosphere. It was added to my list of favorites today. I love when synchronicities occur, calling my attention to something important, usually a vital message for me. 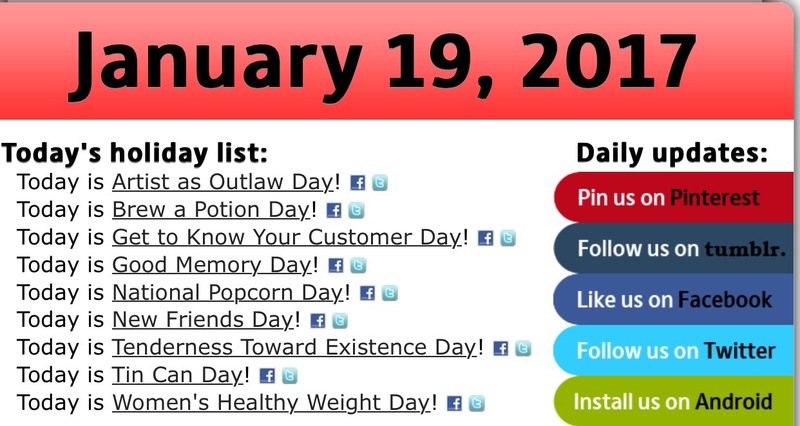 When I opened my iPhone to Google this morning, I discovered a list of unusual holidays for today. Three of those jumped out at me. The focus of my journey this year is on health, and making life a little more tender and art a little more robust. Those three areas appeared on the holiday list today. Please read about Artist as Outlaw Day and Tenderness Toward Existence Day on my Cindy Goes Beyond blog. 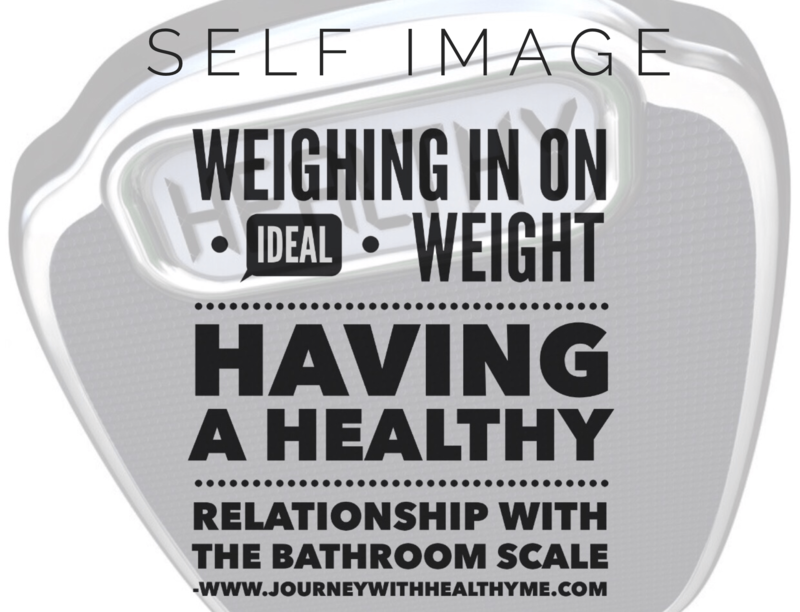 I was intrigued by Women’s Healthy Weight Day, leading me to think about my relationship with my weight, and that oft dreaded bathroom scale. 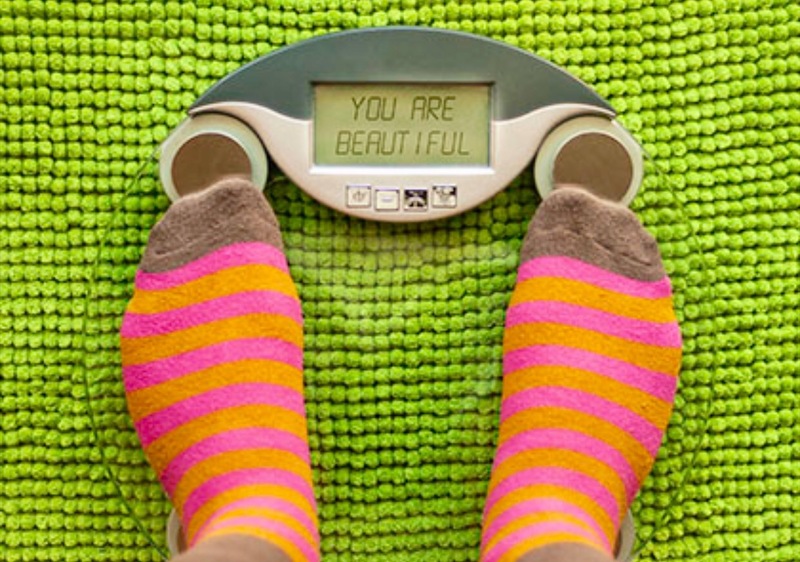 What is an ideal weight, anyway, and who decides on that number for me? Losing weight was not my intention when I stopped eating meat, sugar, gluten, dairy, corn and soy. Feeling better, walking better, releasing pain was my motivation. However, weight loss has occurred as a result of eating fruits and vegetables and avoiding the foods on my no list. For my friends and family, colleagues and clients, what they have noticed most hasn’t been that I no longer use a cane when I walk. At least, that’s not what they first comment on. They remark about the weight loss. I understand. We are a culture that notices physical changes. I like to point out that what they are seeing is me, being healthier. Me, feeling so incredibly good, I am euphoric. What isn’t immediately noticeable are the changes within, and the shifts in my beliefs about health and food. I have long had a hate relationship with the bathroom scale. I’m not sure when this object got to decide for me how my day was going to go, but one peek at a number either made me feel elated or made me feel like a failure. With health as my goal this time, the scale has become unimportant. I rarely weigh, relying primarily on how my clothes fit as an indicator that I’m slimming down. I’m not free from the need to measure progress entirely. I still own a scale and I know approximately how much I’ve lost. However, I am letting more and more time pass by, in between checking in on my weight. My desire is to let my body discover her own ideal weight. Rather than rely on the scale or a chart or someone else’s ideal, I am trusting my body to find her way to the perfect size for me. I am so much more than a statistic or a number on a graph. I am uniquely me. As I heal from viruses and inflammation, as I consume clean, wholesome food, simply prepared, my body will continue to respond by becoming healthier, leaner, stronger, more fit and vibrant. Who I am and how I feel is so much more crucial to me than how much I weigh. Losing pounds has not been a strong enough motivator to succeed at maintaing my ideal weight. However, health, wellness, vitality and life are powerful inspiration indeed. Very soon I will toss the scale. And check in instead with my body, my heart, my sense of wellness, to see how I am doing. That sounds pretty ideal to me. I am excited today to launch a new adventure. 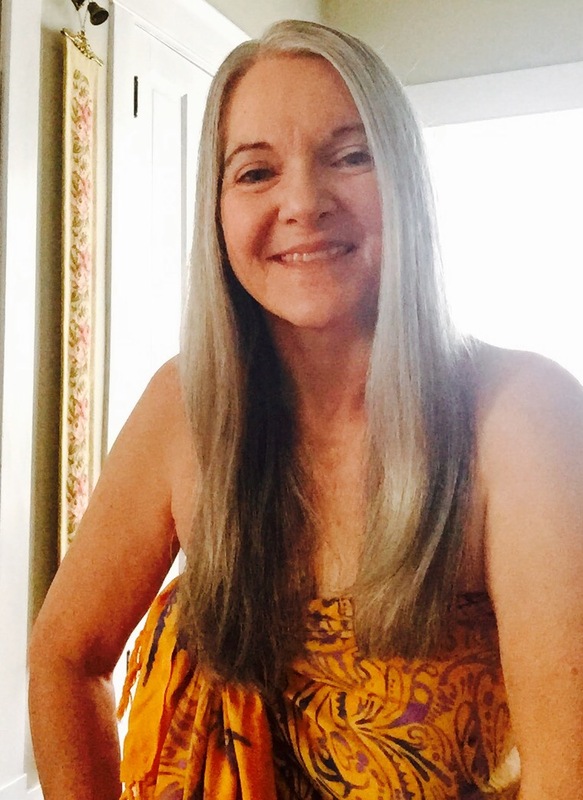 This blog focuses on my healing journey that began six months ago, and continues on. 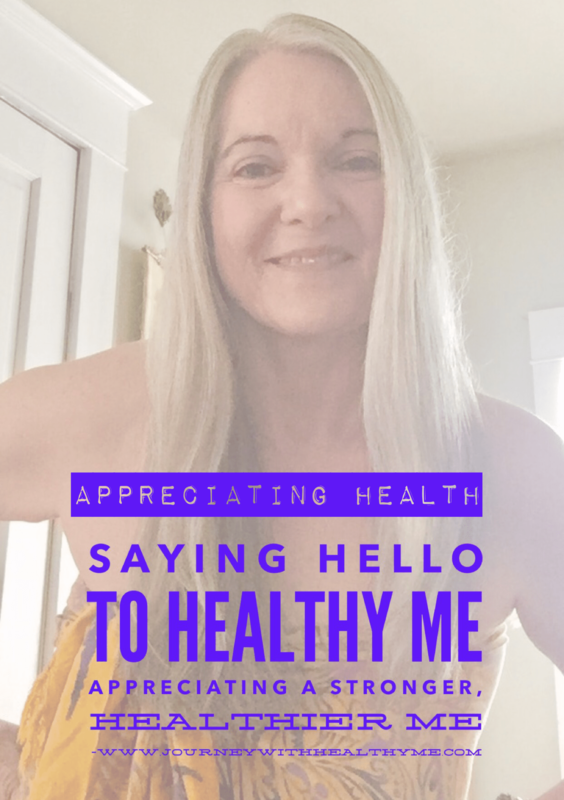 Check out my About Page, for a brief account of what led me to begin this journey of taking back my health and well being. Six months later, I am so grateful that I made the decision to look at my health in a different way, and take full responsibility for it. I embraced a plant based diet at that time. The plant based diet has become a plant based lifestyle. I will not return, ever, to the poor diet that kept me sick and in pain. My desire for this blog is to share what I am learning, as I continue to improve my health, vitality and well being. There will be recipes, information about the plant based lifestyle, tips and techniques, and encouragement for those who are considering a change or feel ready to assume responsibility for their health. Me fourteen months ago, at the family Halloween party, needing a cane to walk and approximately 50 pounds heavier. Here are a couple of my most frequently asked questions, in case others are wondering as well. What foods do you eat? And what foods do you avoid? By far the most common question I get, this one is an easy answer. I eat fruits and vegetables, raw and cooked, brown rice, nuts, and foods made from fruits and veggies, such as smoothies, salsa and hummus. On the “do not eat” list is meat, dairy products, sugar, gluten, corn, soy, and canola oil. The foods on the avoid list cause, or feed, inflammation and illness. Soy and corn are on the list because they have been genetically modified. I can have a corn product, if it is GMO free, and also free of the other foods on the do not eat list. What about the holidays? Did you stay on a plant based diet? Yes, I stayed faithful to the plant based lifestyle over Thanksgiving and Christmas. My family was wonderfully supportive, fixing a traditional Thanksgiving dinner while also offering several plant based options. Christmas was buffet style, with everyone contributing to the meal. I brought along plant based dishes to include, for both meals. I didn’t feel like I missed out at all. The most important part of the holiday season was being with my family, and I did that! How long are you going to stay on this diet? I will stay on this path. The diet has become a lifestyle. I feel too good to return to my old way of eating. It isn’t a matter of will power. It is a matter of feeling good. As I like to say, nothing tastes as good as healthy feels. I will be answering other questions, sharing about the differences between going on a diet, and embracing a lifestyle, and discussing everything from which supplements build up the body’s immune system, to thoughts on a healthy relationship with food, to what I am learning about fighting illnesses and preventing disease. And join me, on this healing journey, as I become the healthiest, most vibrant version of myself. Journey with healthy me! Me now, after six months on my healing journey. No cane, no pain, feeling better than I have felt in more than 20 years.